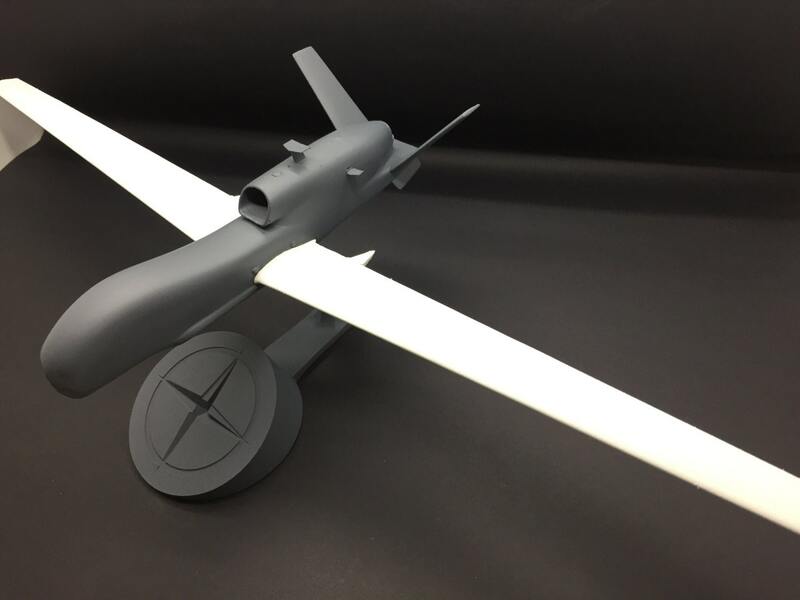 This is a model I designed for display inspired by the RQ-4 NATO AGS Globalhawk Unmanned Aerial Vehicle (uav, drone, etc). This was done in collaboration with "Oranhunter", the guru of all things Blender. Thanks Steve! It has a 18 inch wingspan and is 5 inches tall when sitting on it's stand. 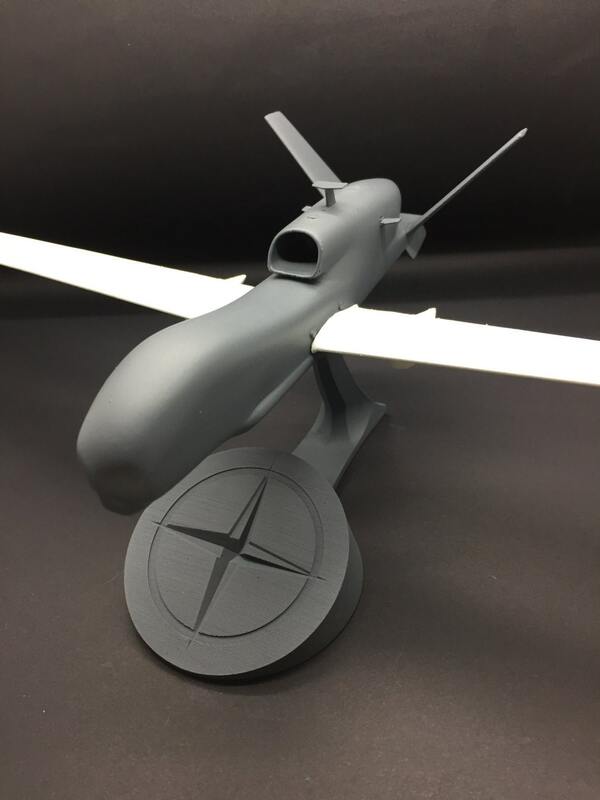 The stand has the NATO logo, and the model includes all of the engine and wing antennas. The wings feature landing gear pods. The stand is cast in the highest quality urethane resin with no fillers, and the rest of the model is 3D printed and hand-fitted and sanded for a smooth finish. 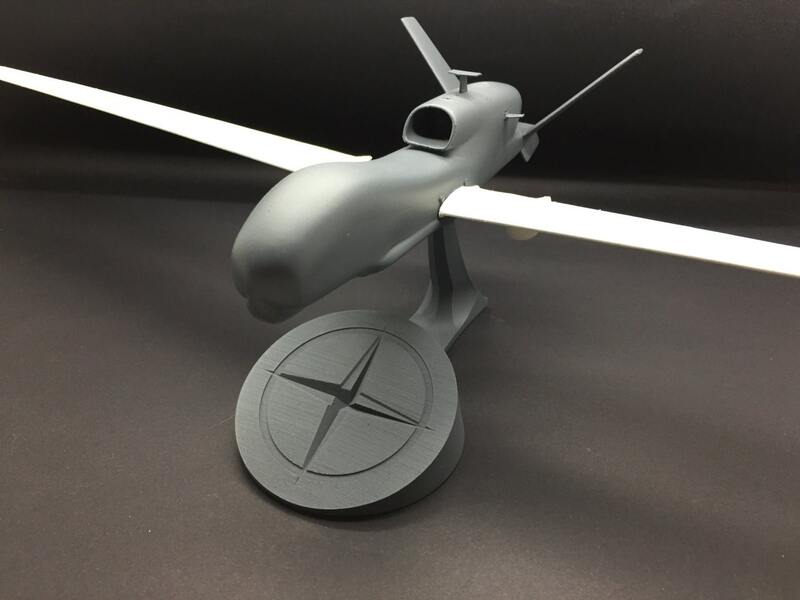 I then paint each model to duplicate the color and sheen to match the real RQ-4. The stand mold is actually quite expensive to make, and I get a limited number of RQ-4s from each set. 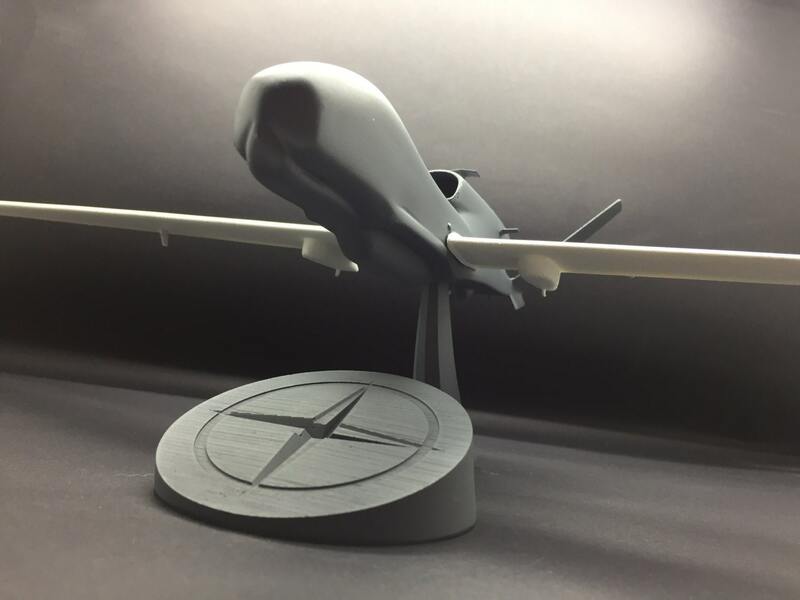 Alliance Ground Surveillance (AGS) is a NATO programme to acquire an airborne ground surveillance capability (Multi-Platform Radar Technology Insertion Program on the Northrop Grumman RQ-4 Global Hawk). In a similar fashion as with Strategic Airlift Capability the program is run by 15 NATO member states: Bulgaria, Czech Republic, Denmark, Estonia, Germany, Italy, Latvia, Lithuania, Luxembourg, Norway, Poland, Romania, Slovakia, Slovenia and the United States. AGS is scheduled to reach initial operational capability by the end of 2017. The Main Operating Base will be located at Sigonella Air Base, Italy. First Global Hawk Block 40 UAVs destined for the NATO AGS program rolled off Northrop Grumman production line in San Diego, 4 June 2015 and arrived at Edwards on Dec. 19, 2015 completing its first flight. If you prefer to add text to the NATO stand, that stand will be 3D printed. If you select the other stands they will be resin. Please note, this creation is a work of fan art and is in no way affiliated with General Atomics Inc.